type-of-html: High performance type driven html generation. This library makes most invalid html documents compile time errors and uses advanced type level features to realise compile time computations. type-of-html is a library for generating html in a highly performant, modular and type safe manner. Note that you need at least ghc 8.2. Part of the html spec is encoded at the typelevel, turning a lot of mistakes into type errors. >>> td_A (A.coords_ "a") "b"
• In the expression: td_A (A.coords_ "a") "b"
In an equation for ‘it’: it = td_A (A.coords_ "a") "b"
>>> td_A (A.id_ "a") "b"
Every parent child relation of html elements is checked against the specification of html and non conforming elements result in compile errors. The same is true for html attributes. some elements can't contain itself as any descendant: at the moment we look only at direct children. This allows some (quite exotic) invalid html documents. some elements change their permitted content based on attributes: we always allow content as if all relevant attributes are set. Never the less: these cases are seldom. In the vast majority of cases you're only allowed to construct valid html. These restrictions aren't fundamental, they could be turned into compile time errors. Perhaps a future version will be even more strict. Please note that the type of page is inferable, so ask ghc-mod or whatever you use to write it for you. If you choose not to write the types, you don't need the language extensions. I strongly suggest that you don't write type signatures for type-of-html. If you want to opt out, wrap your types into the 'Raw' constructor. This will increase performance, but can be only used with trusted input. You can use this e.g. to embed some blaze-html code into type-of-html. >>> div_A (if True then Right (A.id_ "a") else Left (A.class_ "a")) "b"
If you use Either, both possible outcomes are typechecked if they are valid children. You can combine Either, Maybe and Lists in any way you want. The types will get jolly complicated, but if you don't write the types, you'll be good. 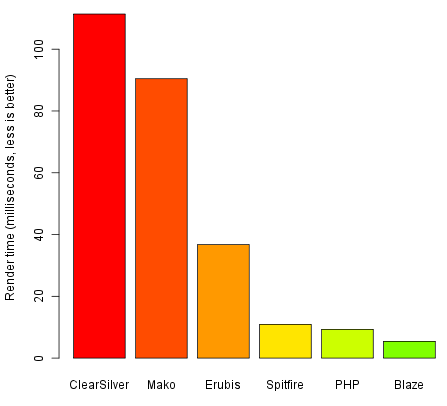 type-of-html is a lot faster than blaze-html or than lucid. 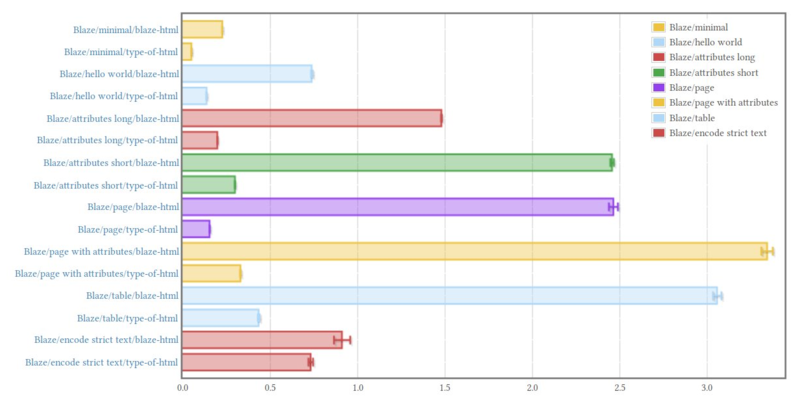 Remember this benchmark from blaze-html? To look at the exact code of this benchmark look into the repo. The big table benchmark here is only a 4x4 table. Using a 1000x10 table like on the blaze homepage yields even better relative performance (~9 times faster), but would make the other benchmarks unreadable. How is this possible? We supercompile lots of parts of the generation process. This is possible thanks to the new features of GHC 8.2: AppendSymbol. We represent tags and attributes as kinds and map these to (a :: [Symbol]) and then fold all neighbouring Symbols with AppendSymbol. Afterwards we reify the Symbols with symbolVal which will be embedded in the executable as Addr#. All this happens at compile time. At runtime we do only generate the content and append Builders. Because all functions from this library get inlined, we'll automatically profit from future optimizations in ByteString.Builder. Note that the compiler automatically sees that your string literal doesn't need utf8 and converts directly the "test"# :: Addr# to an escaped Builder without any intermediate structure, not even an allocated bytestring. This sort of compiletime optimization isn't for free, it'll increase compilation times. Note that compiling with -O2 results in a ~25% faster binary than with -O and compiling with -O0 compiles about 15 times faster, so be sure that you develop with -O0 and benchmark or deploy with -O2. Be aware, that cabal compiles only with -O if you don't specify explicitly otherwise. If you've got attributes or contents of length 1, use a Char. This allows for a more efficient conversion to builder, because we know the length at compile time. If you know for sure that you don't need escaping, use Raw. This allows for a more efficient conversion to builder, because we don't need to escape. If you've got numeric attributes or contents, don't convert it to a string. This allows for a more efficient conversion to builder, because we don't need to escape and don't need to handle utf8. If you know that an attribute or content is empty, use (). This allows for more compile time appending and avoids two runtime appends. If you know for sure a string at compile time which doesn't need escaping, use a Proxy Symbol. This allows for more compile time appending and avoids two runtime appends, escaping and conversion to a builder. These techniques can have dramatic performance implications, especially the last two. If you replace for example in the big page with attributes benchmark every string with a Proxy Symbol, it'll run in 10 ns which is 500 times faster than blaze-html. Looking at core shows that this is equivalent of directly embedding the entire resulting html as bytestring in the binary and is therefore the fastest possible output. You can use an even more performant representation if you can sacrifice some flexibility. If every variable of your html document is just some type which will be converted into a Builder, you can render your entire html document as a list of ByteString which will be cached by ghc and interspersed with variables. This will be in a lot of cases orders of magnitude faster. This is especially the case with larger pages. For very small pages (let's say upto 5 elements) this technique is slower. I'd generally recommend that you put your documents into an extra module to avoid frequent recompilations. Additionally you can use type-of-html within an blaze-html document and vice versa. This allows you to gradually migrate, or only write the hotpath in a more efficient representation. Why don't you provide a pretty printer? It may include a link, so it would be dynamic. The user of the browser is free to activate a custom css. This would be semantically correct, but would this be pretty? I recommend, that if you want to debug html, use mozilla fire bug, so you can as well fold trees and look at the rendering. Why don't you keep track of appended tag lengths at compile time? Well, it's true that we could improve performance a miniscule by that: by knowing the length of the string, we could just use internal bytestring functions to copy over the addr#. This would avoid a ccall to determine the length of the addr# more or less per tag. At the other hand, luckily ghc moves all these bytestrings to the toplevel in core, so we have this cost only the first time we use this bytestring. Considering that most webpages have a lot more than one visitor, this dwarfs the cost (about 3 nanoseconds) a lot. The negative side of doing this would be a severe complication for the typechecker, which is already quite stressed with this library. Besides, there is a ghc ticket about replacing compile time strings (addr#) with bytearray#, which contains it's length. So in some future, we'll have this for free. Wouldn't it be more efficient to append all compile time stuff to one huge Symbol and use '[(Nat,Nat)] to slice it? Cool idea, but no. This would reduce memory fragmentation and avoid a terminating null more or less per tag at the cost of the lost of sharing. Being unable to inspect a Symbol, we would end up with a lot of repetitions, which are at the moment shared. Even the bytestring, which is used for the Symbol, is shared of equal Symbols. Isn't there any performance tweak left? As far as I know: no. If you disagree, please file an issue.